It's time for the New Product Launch! All the Stamps, Die-namics, and Stencils can be found HERE. Please remember to visit each of the MFT Designers' August New Product Launch posts on the MFT Blog and leave a comment by the end of the day on Thursday, August 4 for your chance to WIN one of two, $100 Gift Vouchers. Ready? Set. Comment! 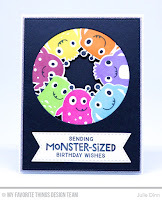 I have two bright, fun cards to share with you today, the both feature the fabulous Monster Love stamp set and Die-namics. I seriously had so much fun playing with this set! For my first card I stamped the monsters in Lemon Drop, Orange Zest, Grape Jelly, Blu Raspberry, Razzle Berry, Limelight, and Pure Plum Premium Dye Ink. Each monster was die-cut with the Die-namics and then placed within the circle window. For my second card, I stamped the monsters in Limelight, Razzle Berry, and Orange Zest Premium Dye Ink. I used the Stitched Triple Peek-a-Boo Windows Die-namics to create the windows for the monsters to peek out of. The sentiments on both cards came from the Monster Love stamp set. There are a ton of fun ones included in this set! Thank you so much for joining me all week. I hope we have inspired you to create something amazing! Be sure to check out the MFT Blog to see all the fantastic creations the design team has created to share with you. Don't forget to comment for your chance to win a gift voucher. Agreed! The monsters ARE adorable. Love the first one, especially....looks like a bunch of them peeking up from a manhole...lol! Love the monsters! Your first card makes me smile cuz their all grinning at me! Silly, right? All those silly faces peering in the window are just too cute. What clever ideas! Love both cards but especially the one with the monsters peeking in through the circle! I adore the circle of monsters! I have some girlfriends that I see could use this!!!! What a fun and creative design! Sure to put a smile on the recepient's face! Thanks for the inspiration! OMGosh this is so cute, I love it when monsters are looking in at all ends. Fun cards. Nice and colorful. So many monsters to see today, and I'm not afraid at all :-) Love your card. Colorful and cute! Thanks for sharing! Both cards are totally adorable. I love bright monsters peeking from the dark backgrounds. Love the bright colors! These monsters have made it on to my shopping list. They are just so sweet and fun! Both cards are really fun. Love the addition of the silver sparkle cardstock. MFt's colours are bright, creating fun pop of colourful monsters! Monstrously adorable, tfs! Your two fantastic cards really capture the charm of the darling monsters! Adorable cards! Love the bright colors! What a fun way to use those Monsters stamps! I love it! These Monster cards are too cute and fun! The first one is great with the Monsters peeking through the circle window! And, I love the Stitched peek-a-boo circles...so many uses and you made such cute use of it! Super cute cards - love all of the happy colors. Oh my gosh, what fun cards! Who knew monsters were so adorable?! Cute cards! Love the use of the window type dies with the monsters peeking through! Love these bright and cheerful monster cards!! This card is so cute, great for kids of all ages. so many cute and fun critters! 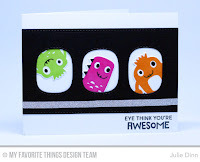 Love your sweet, bright and colorful monster cards! Who wouldn't love to get one of these? Oh goodness these are so stinkin' cute!! Super cute cards Julie. Those bright monsters are so sweet! Very cute and colorful card designs with these monsters. oh my goodness... what a super cute card! Your cards are adorable! Love all the colorful monsters! Love your monsters. I have grandsons who would be thrilled with these images. LOVE how you used those sweet little monster stamps. These are very clever, cute and original!!! Your cards are adorable. So bright and fun. Your card really made me smile! Both of your cards are adorable. I love the little monsters peeking out of the peek a boo windows. This little die is on my must have list! The monsters are adorable. Love the circle of monsters. Both cards are adorable and fun! Love your little monsters! Adorable cards. Love the colors. I love that circle card! Great fun cards. Love the super colors against the black. My kind of monsters... cute! Both cards are so fun and colorful! Super cute card! Love those little monsters! Fun cards! The dye ink is awesome- such nice colors! Great designs for these adorable monsters! Very clever! I love them both. Those monsters are so fun! I love their expressions! Adorable monsters! Love how colorful this card is!! These monsters are just so cute! 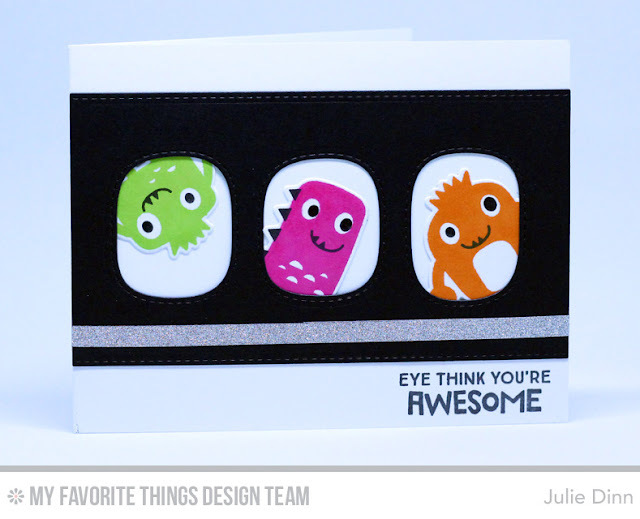 Eye think your card is awesome- lol- sorry I had to say it. OH my your cards are so CUTE!!!! Love them both!! Awesome cards! Love those monsters! Like how the monsters are peeking! darling cards with awesome colors! Love the monsters! I like your peek-a-boo monsters! Super cute cards--love the colors! Both cards had me smiling. So cute to have them all peering in or out of something. These monsters are so cute especially when they are peeking through the windows. aw love how these cuties are peeking out! Adorable! Love these little monsters! I cant get enough of these adorable little monsters. Great cards!!! So cute! I love those little monsters! Those monsters are adorable! Love how they are peeking out! Such a fun card, love your monsters!